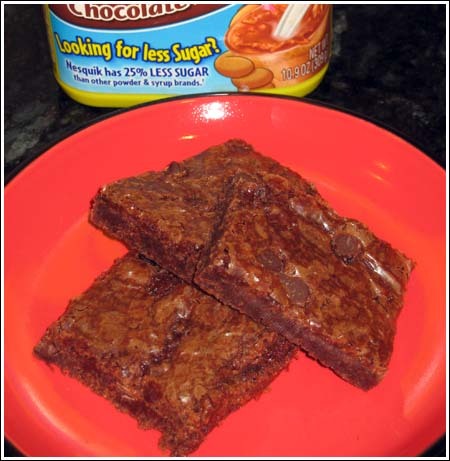 Nestle Quik Brownies are dense fudge brownies made with Nestle Quik. Preheat oven to 350° F. and line an 8 inch metal pan with foil; spray foil with cooking spray. In a medium size (3 quart is good) microwave safe mixing bowl, melt butter for 1 minute on high. Stir in sugar and water, then microwave mixture for 30 seconds to help melt sugar. Stir and let stand for about 3 minutes. Add egg and and stir until mixed. Stir in Nesquik, then add flour mixture and stir just until smooth. If the batter is still very warm, allow it to cool a bit (so the chips won't melt when added) then fold in chocolate chips. Rap pan on counter to bring air bubbles to top. Bake for 18 minutes. Let cool completely on a wire rack. Chill for an hour or so, then lift from pan and slice into 12 brownies.